The Queen’s University Alumni Association (QUAA) and University Council are calling on alumni to help promote a safe, respectful, and inclusive Homecoming 2018. Read about ways you can contribute. The Queen’s University Alumni Association (QUAA) Board of Directors, together with Queen’s University Council, is pleased to extend a congratulations to all alumni celebrating a milestone reunion in 2018. 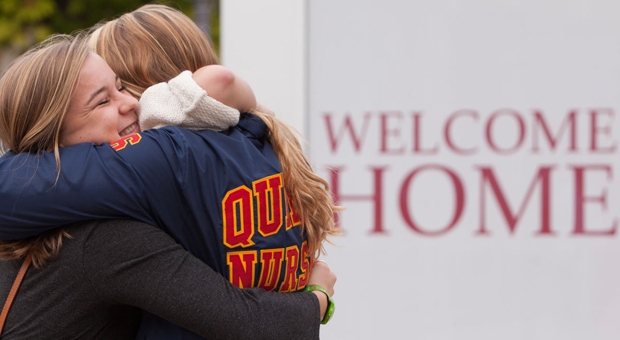 Since 1926, Homecoming at Queen’s has been an opportunity for alumni to reconnect on campus, to engage with students, staff, faculty, and friends, and to celebrate what it means to be a part of an incredible community. However, this tradition is being overshadowed by unsanctioned street parties and alcohol misuse, which has led to serious concern for safety, overburdening of essential services such as hospitals and police force, and has strained Queen’s relationship with the City and community. This year, University Council has been engaged in reviewing alcohol use and misuse with the aim to provide strategic recommendations to the University to reduce the potential for harm to students, mitigate the negative impacts on the community, including its services, and restoring Queen’s reputation. If you are returning to campus for Homecoming, plan your reunion events around official Queen’s events. Faculty, staff, volunteers, and student groups work tirelessly to organize these celebrations and coordinate the best reunion experience possible. Find the list of events on the events page. Learn about the new joint Safety Initiative between Kingston and Queen’s, which will require anyone issued a summons to provincial offences court to appear in person before a Justice of the Peace in Kingston to deal with the fine, regardless of where they live. If you encounter the need for support services for student safety or for students in distress, please call Campus Security Emergency Report Centre (ERC) at 613-533-6111. The blue lights emergency posts around campus will also connect you to the ERC. The Queen’s University Student Safety App (developed by two Queen’s alumni) can also be downloaded. Visit the Division of Student Affairs website to download SeQure. Enjoy all of the ReUnion Street Festival events happening on Union Street throughout the Saturday night of Homecoming, including performances by a wide variety of musical acts. Inform and inspire fellow alumni to be active participants in a better Homecoming for everyone. Share this information across your networks. On Oct. 19–21, 2018, we hope that all alumni will stand together to protect the tradition of Homecoming. As your alumni volunteer organizations, we are proud of the accomplishments of our alumni community as individuals and as a network of more than 155,000 graduates in 155 countries around the world. These are the achievements that deserve to be celebrated, shared, and to define Queen’s. We welcome your thoughts and feedback and hope to see you on campus soon. If you would like to send us your feedback, please email the Reunions Team.